JOJO’S BIZARRE ADVENTURE © 1986 by Hirohiko Araki & LUCKY LAND COMMUNICATIONS/SHUEISHA Inc.
Viz Media is releasing a deluxe hardcover volume of Jojo’s Bizarre Adventure: Part 3 – Stardust Crusaders on November 1. The volume covers the first part of the popular third arc in the long-running series by Hirohiko Araki. Stardust Crusaders will also be available digitally through VIZ.com, Viz Manga App, Nook, Kobo, Kindle, iBooks, comiXology, and GooglePlay. For future releases, Viz intends to publish the volumes on a quarterly basis. Besides the manga, Viz Media also publishes the anime in North America. The series is currently airing on Toonami. San Francisco, CA, October 24, 2016 – VIZ Media, LLC (VIZ Media), a premier company in the fields of publishing, animation distribution, and global entertainment licensing, announces an exciting new addition to the acclaimed JOJO’S BIZARRE ADVENTURE saga with the release of JOJO’S BIZARRE ADVENTURE: PART 3 – STARDUST CRUSADERS on November 1st. Created by Hirohiko Araki, JoJo’s Bizarre Adventure is a groundbreaking manga series famous for its outlandish characters, wild humor and frenetic battles. JOJO’S BIZARRE ADVENTURE: PART 3 – STARDUST CRUSADERS is the third story arc in the overall series and will be published in a deluxe, hardcover edition under the Shonen Jump imprint and is rated ‘T+’ for Older Teens. Volume 1 will carry a print MSRP of $19.99 U.S. / $22.99 CAN. JOJO’S BIZARRE ADVENTURE: PART 3 – STARDUST CRUSADERS will also be available digitally from VIZ.com and the VIZ Manga App, as well as from the Nook, Kobo, Kindle, iBooks, comiXology, and GooglePlay stores. Future volumes of the series will be published on a quarterly basis. JOJO’S BIZARRE ADVENTURE depicts the long-running, multi-generational adventures of a family of mighty heroes – the Joestars. As the STARDUST CRUSADERS arc opens, a fiendish villain once thought to be dead has resurfaced and become even more powerful! To fight this evil, the aging Joseph Joestar enlists the help of his hot-blooded grandson, Jotaro Joestar. Together they embark on a perilous adventure that will take them around the world! Manga creator Hirohiko Araki made his manga debut in 1981 with the Wild West story, Busô Poker. He experimented with several genres, including mysteries (Mashonen B.T.) and action-horror (Baoh), before beginning JOJO’S BIZARRE ADVENTURE in 1986. Propelled by imaginative storylines, surreal imagery and individualistic artwork, JOJO’S BIZARRE ADVENTURE is one of the longest-running and most popular shonen manga ever released. Araki’s current works include a new series set in the JOJO’S universe, JoJolion. 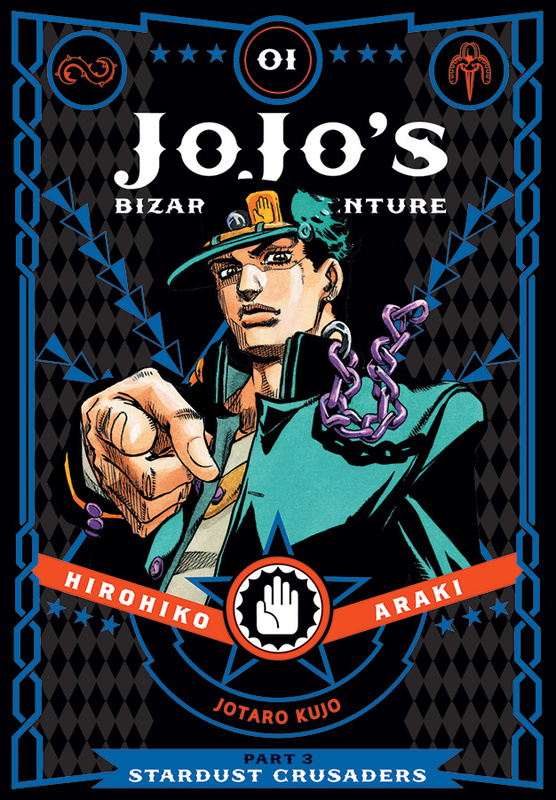 VIZ Media is the North American master merchandise licensee for JOJO’S BIZARRE ADVENTURE and also publishes the manga series in print and digital editions. Readers are invited to enjoy the earlier JOJO’S BIZARRE ADVENTURE manga releases that include JOJO’S BIZARRE ADVENTURE: PART 1 – PHANTOM BLOOD and JOJO’S BIZARRE ADVENTURE: PART 2 – BATTLE TENDENCY. VIZ Media also distributes the JOJO’S BIZARRE ADVENTURE anime series. For additional information on JOJO’S BIZARRE ADVENTURE and other manga titles distributed and published by VIZ Media, please visit www.VIZ.com. Next Post:Sentai Filmworks Licenses Long Riders!